Yes, we’re stunned. This is a surprisingly effective attempt at creating a new style of controller, and certainly worth a look. Time to eat a little humble pie here and admit something. 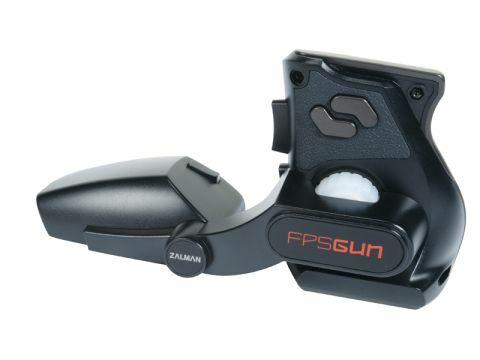 When I first clapped peepers on the FPS Gun in press releases, and even out at CeBIT on the Zalman stand, I thought it looked like a bit of a joke. I wanted to get it in to have a quick play around with it and laugh at their absurd idea of trying to make a mouse shaped more like a gun, specifically for first-person shooters. Well, paint me purple and call me a dinosaur but this thing actually works. It did feel faintly ridiculous trying to manoeuvre the cursor around the desktop with this malformed mouse, but as soon as I got into a CoD4 deathmatch it all made sense. The actual sensor is located in the foot that stretches out in front of the base of your fist, this means that it instantly feels different to using a standard mouse in-game. The FG-1000 acts much more like a gun with your left and right movements operated by swivelling the wrist rather than moving the whole hand across the desktop. It takes a while to get used to, but once mastered it could give you far more lateral control over your crosshair. My only real gripe with the FPS Gun though, aside from the handle being slightly too short for comfort, is that lack of fully configurable buttons. You can change between the standard mouse functions but you cannot add keystrokes to the configuration, something I'd really hope to see in later revisions. At the moment it might be a little pricey to encourage you to pick up on a whim, but give it a go in a shooter and you might just change your mind.